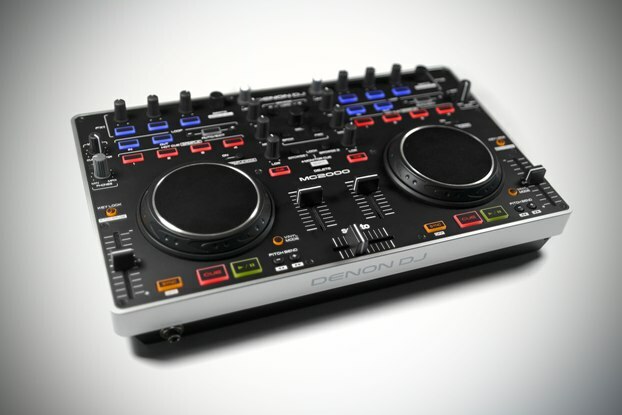 Denon DJ MC2000 Released: Best Beginner Controller Yet? 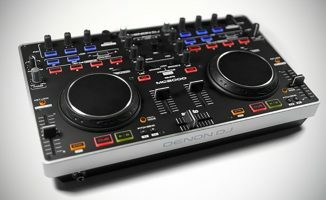 The Denon DJ MC2000 is a consumer DJ controller but with pro build quality, and looks to be the easiest DJ controller to plug and play with yet. Is this the perfect beginner DJ controller? Professional-grade construction in a consumer DJ controller? 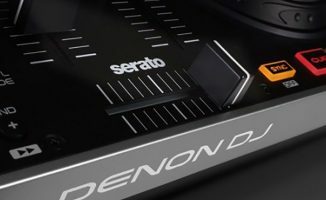 That’s the promise of the new Denon DJ MC2000, which combines a high-quality build with a reasonable price and the no-frills software approach of Serato DJ Intro. 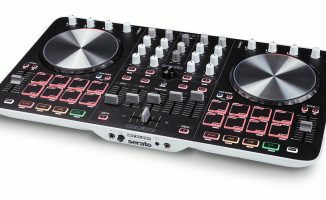 A quick glance at the layout and the feature set reveals tight one-to-one layout and mapping with the software – and with Serato DJ Intro widely lauded to be the easiest DJ software out there, that would potentially make this the most beginner-friendly DJ controller yet. Read on for our first thoughts, launch video and full photo gallery, or go to our full Denon DJ MC2000 review. 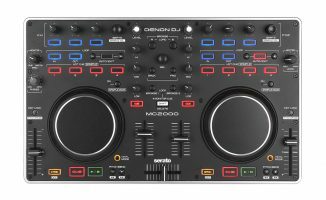 The controller is two-deck (as is the software), and offers hot cue and sample control, access to track browsing features, as well as control over the two effects units of Serato DJ Intro. It has mic and line inputs in addition to the two software channels (both have level controls and the line input seems to also have a “monitor” control, presumably for headphone monitoring level), which would suggest the line input could be used as an emergency through. The Denon DJ MC2000 is tightly mapped and laid out to reflect what you see on the screen. The jogs are Denon standard (ie good), and control over the music will no doubt be tight and true; on every Serato controller I’ve ever tried, the jogwheel mappings have been perfect one-to-one. If you’re coming to this controller and to Serato from vinyl or from sub-standard spongy mappings on some other hardware/software combinations, I am sure you’ll be pleasantly surprised. No doubt the pitch controls will be fine enough for manual beatmatching (our forthcoming review will verify that), and a full three-band EQ with gain controls means that for DJs returning to the game having used separate decks-and-mixer set-ups in the past, it will all feel very familiar. While the unit has the aforementioned gain (“level”) controls for each channel, there are no VU meters, either on the software or the hardware. Luckily Serato DJ Intro has autogain which for the target market would be fine, but nonetheless it’s a shame there aren’t meters in the software bearing in mind they don’t appear on the hardware itself. It looks like the best integration yet with Serato DJ Intro yet, albeit with a couple of limitations. The unit is Midi mappable to other software, so while out of the box you’re tied to the limitations of Serato DJ Intro (you can’t record your sets from within the software, for instance), you can change if you wish later on. However, to be fair Serato DJ Intro is generally excellent – intuitive, easy to use, and with high-quality sound. 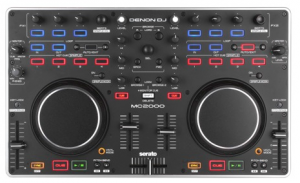 Denon’s smart decision to cover pretty much all of the basics, put great beginner software in the box, and ensure the construction standard is high enough for pro performance as well as complete beginners, means that for either learning DJing at home or a no-frills set-up for gigging on, The Denon DJ MC2000 appears to be a uniquely attractive controller – despite the fact that it’s really nothing new. Many DJs (I suspect a silent majority) don’t want any more than this, and don’t want to jump through any hoops at all to just get up and running. For those people, the Denon DJ MC2000 could prove highly attractive. It could also be a good backup controller for pros. I’ve always wondered why the digital DJ industry can’t deliver more simple, easy to use, well-made consumer controllers that have no anomalies, no software/hardware mismatches, and no sneaky limitations that hapless beginners only find out about after they’ve bought them. The Denon DJ MC2000 at first glance seems to be firmly in that category, and Denon is to be applauded for that. Price is expected to be £269 / €325 / $299 (TBC), and we’ll have a full review ASAP. 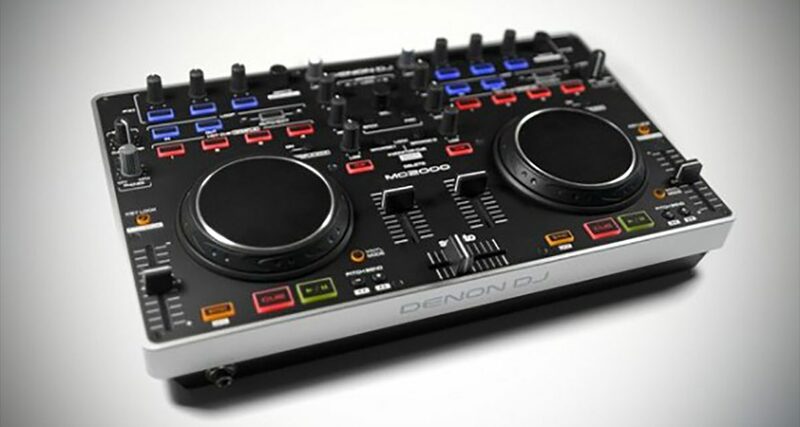 • Read the Denon DJ MC2000 press release over on the Digital DJ Tips Newswire. • See the full official Denon DJ MC200 photo gallery on our Facebook Page. Are you excited by this controller? Does it appear to be the perfect mix of simple-to-use and pro build in your eyes? Or are there things missing that mean it’s not for you? Please let is know your thoughts in the comments. 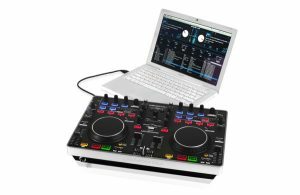 Do you think the price difference compared to a Numark Mixtrack Pro justifiable for a complete beginner? Thanks in advance, great site. I’d wait until we’ve reviewed it first before giving you opinion on that. Do you think the price difference compared to a Numark Mixtrack Pro is justifiable for a complete beginner? I wanted to see higher resolution screenshots of this controller, just to see exactly what’s being offered here, and Google Images could find nothing better than the pictures from this article, which were in the top of their results, BTW. What is this, are you so on the cutting edge now that there isn’t even a higher resolution picture of the controller available?? I think that’s something they’re counting on. Hi, I’m a beginner, would getting a higher end controller such as Numark NS8/7’s etc. be disadvantageous? I just thought investing on something better would be better in the long run. Thanks for the advise! Feeling so hyped up to learn, I’m doing this as a hobby and want to see how far can I go with DJing. I would swear this is a Numark OEM..
From what I know of Denon and what I’ve seen of this so far (we have one here for review), I can tell you it definitely isn’t. If its built as well as the mc3000 it will be a winner.the mc3000 is my first controller after selling my cdjs and love it! thanks for that input. I have held out on getting the denon controller bc of size but this seems to fit the ticket. How is this compared to Reloop Beat Mix in terms of Hardware functionality wise? Why no balanced outs? That kinda upsets me, I mean, how more expensive would it have been to add these?? Totally the wrong market for balanced outs though – this is a beginner controller none of the others in the price bracket have this feature. I am excited to pick this up come its release day. Maybe even play with Serato a bit after I map it for Traktor. I haven’t used Serato regularly in a few years now unless the place has turntables. The lack of vq meters troubles me. I am a beginning dj and want something introductory like this. However, as a beginner, I would like to be able to ensure my music is not getting distorted. How do they get around not having vq meter’s? Would I be better suited getting the Twitch, which seems like a very refined controller for the price, only being about 40$ more. Yet again, the proprietary slicer function seems like something that I would really have to learn, and I don’t want to overwhelm myself. Any thoughts? Twitch offers a more specialised style of DJing, but is currently great value. It “gets around” not having VUs because the software has autogain and a limiter which tells you when you’re playing too loud. i want to start djing, should i get this as my first set? 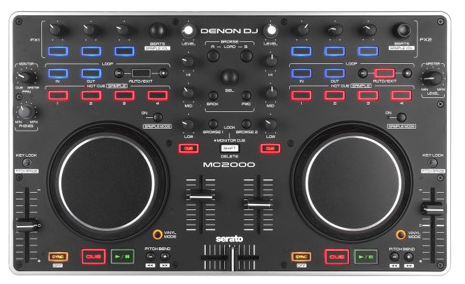 hi i’m a beginner thinking of getting a set myself.. but i’m stuck between mc2000 and pioneer wego.. do you have any advice for me please.. thks in advance..